Rare chromolithographic view of Beijing. An Illustration of the Places to See in Peking. An unusual and attractive 1956 view map of Beijing or Peking, China. 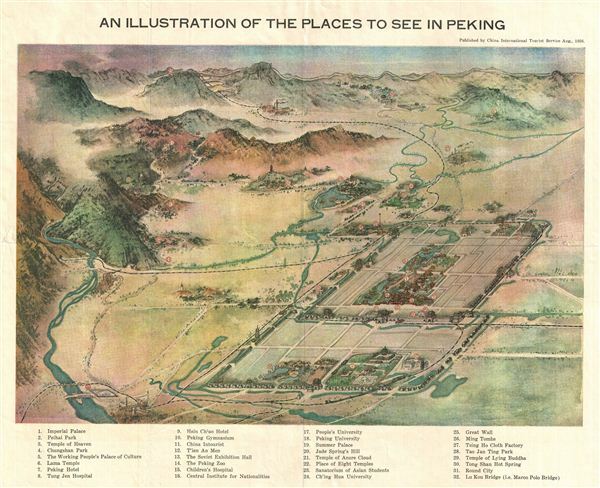 This view covers all of Beijing (as it was in 1956) including the walled center, the Forbidden City, the Summer Palace, and the surrounding countryside as far as The Lu Kou Bridge and, in the distance, the Great Wall of China. Important sites are identified numerically and correspond to an English language table at the base of the map. This view was included in a 1956 tourist booklet prepared by the China International Tourist Service in August of 1956. Peking, China International Tourist Service (Beijing) 1956. Very good condition. Original fold lines. Comes with original descriptive booklet.